Heat oven to 400°F. Generously grease 9-inch glass pie plate with shortening or cooking spray. In medium bowl, mix brown sugar and cinnamon. Add apples; toss to coat. Set aside. In 2-quart saucepan, heat water and butter to boiling. Reduce heat to low. Add Bisquick mix; stir vigorously until mixture forms a ball. Remove from heat. Beat in eggs, one at a time; continue beating until smooth. Spread batter in bottom of pie plate. Arrange apples on top to within 1 inch of edge of pie plate. Bake about 23 minutes or until puffed and edges are golden brown. Serve immediately. Drizzle with syrup. Use slightly tart apples with a crisp texture, such as Haralson apples. If you like a sweeter apple, choose Fuji, Prairie Spy or Gala. 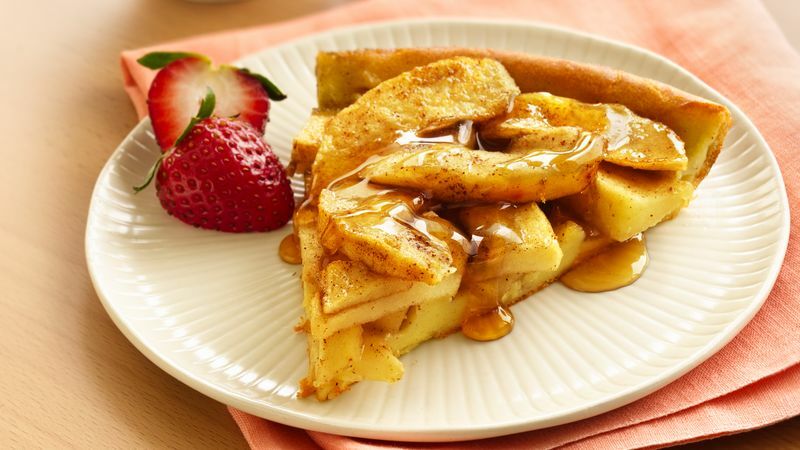 Sprinkle with powdered sugar, and serve with warm maple syrup.